Another firmware for the N95 has been released. At the moment it is only for a few product codes but should be released to more soon. There are not any major changes in this firmware, although some features that were previously only available with 3rd party tools are now built in. One of these is that the N95 the Auto Screen Rotation feature that was available in the last update for the N95 8GB. There is also a auto-download option within the Video Centre so you don’t need to manually download any video subscription videos any more. 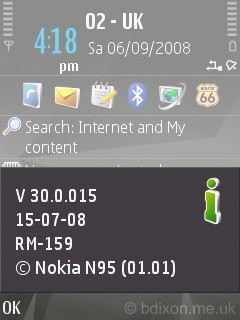 There is also a new theme, previously seen on the N81. So far i have only noticed a few differences, one being that the gallery is now much quicker to display thumbnails of your pictures. Another notable change is the introduction of Widget support. These are essentially the same as applications but they run in a web runtime, and can be used to display information from battery life to rss feeds to currency conversion rates. At the moment i’ve only found a couple that are of any real use but i’m sure more will appear as more people get this update.